I’ve been in a huge chocolate mood lately. I know you probably can’t tell by looking at what I’ve posted lately, but it’s true! 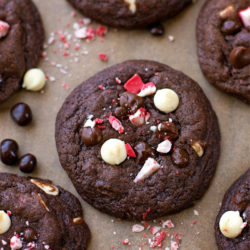 And the only thing that I’ve wanted are these soft, fudgy triple chocolate cookies. That’s right, these babies are loaded with three kinds of chocolate- semisweet, bittersweet and white. 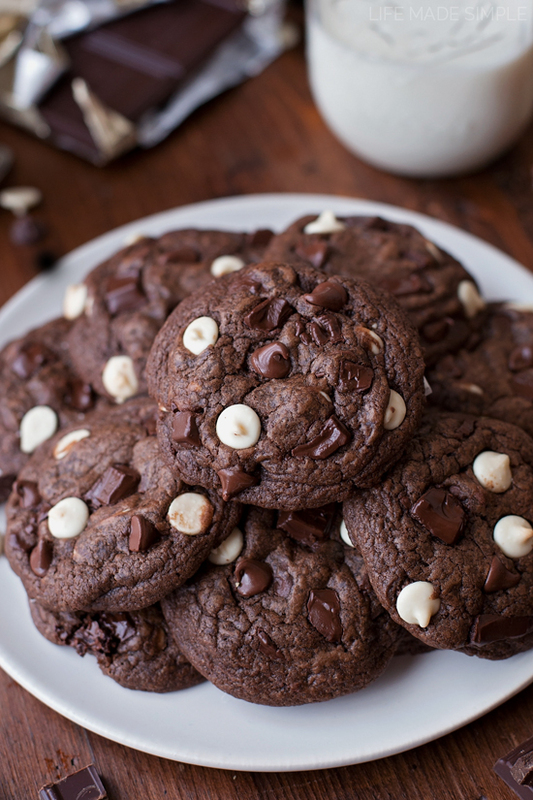 Pure chocolate bliss right here! 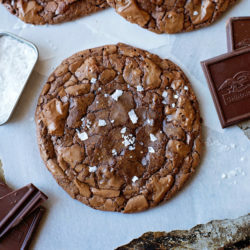 Truth be told, I haven’t really found a chocolate cookie recipe that I love. It’s taken me quite some time to come up with a recipe that is rich, dense and chocolatey. My husband really dislikes cake-like cookies (there’s definitely a shortage of whoopie pies on this blog) so getting that perfect texture was really important. I used Ghirardelli unsweetened cocoa as the base, but if you like you cookies on the darker side you could definitely use cocoa rouge (I’ve done that and they were heavenly). I added LOTS of semisweet chocolate chips, white chips and chopped bittersweet chocolate- the real star of the show here. 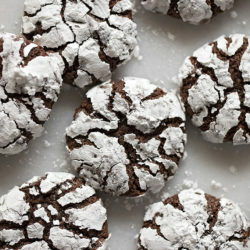 Chopped chocolate gives these cookies lots of flecks throughout and the chunks stay nice and melty. It makes for such a delicious bite! Bake them for just 8-10 minutes. Resist the urge to leave them longer or you’ll end up with crumbly cookies. Remember, we’re going for dense and chewy. As they cool on a wire rack they’ll flatten a bit and firm up, that’s exactly what we want. As soon as they’ve cooled for about 10 minutes, gobble them up! Enjoy & happy baking! 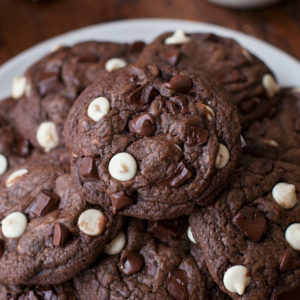 These thick and chewy triple chocolate cookies are for extreme chocolate lovers only! 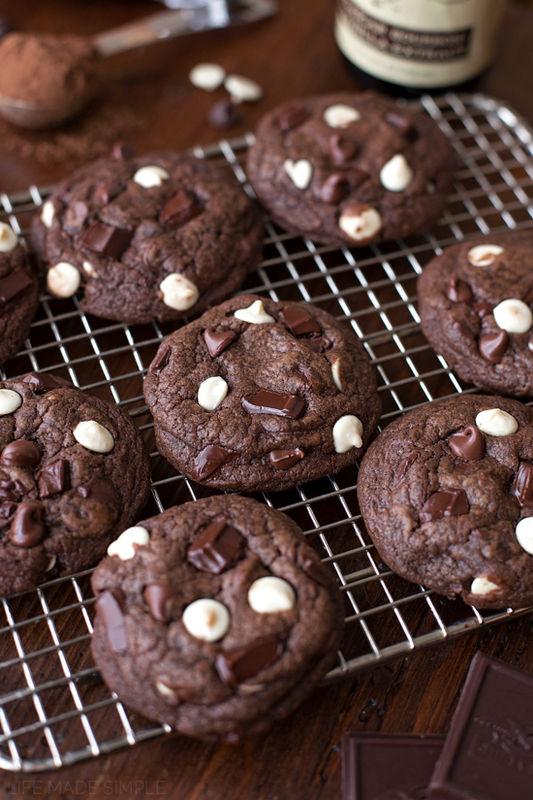 They're loaded with white, semisweet and bittersweet chocolate chips & chunks. Preheat oven to 350 degrees. Line baking sheets with a baking mat or parchment paper, set aside. In a microwave safe bowl, melt one stick of butter (about 45 seconds on HIGH). In the bowl of a stand mixer or a large mixing bowl, combine the melted/room temperature butter, sugar, and vanilla, beat until light and fluffy (about 2 minutes). Add the eggs one at a time, mix just until incorporated. 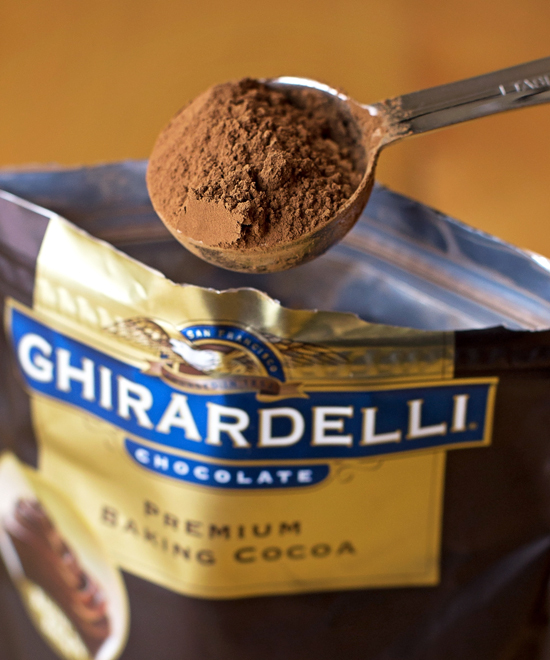 In a medium size mixing bowl, whisk together the flour, cocoa powder, baking soda, and salt. With mixing speed on low, gradually add the dry ingredients, adding the dissolved espresso mixture. Mix just until combined. 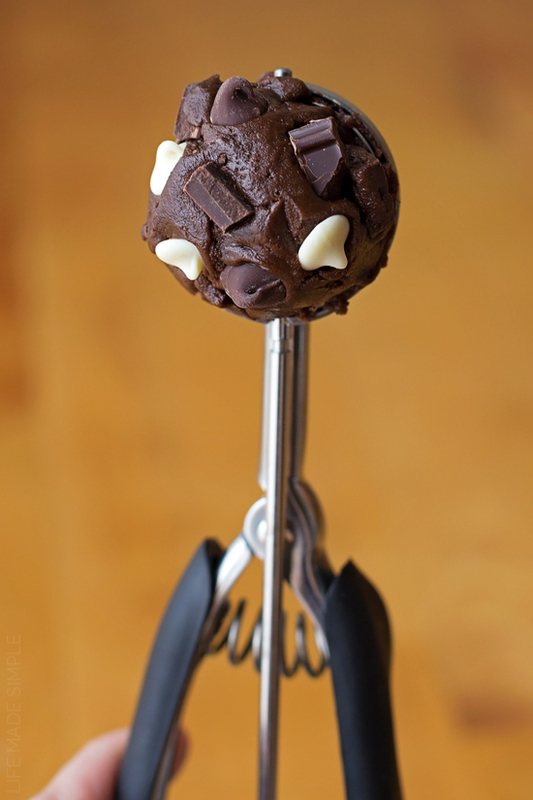 Using a spatula, fold in the chocolate. Using a standard size cookie scoop (1.5 tablespoons) place dough onto the prepared baking sheets (12 per sheet). Place into the oven and bake for 8-10 minutes. They will look slightly underbaked, but they will firm up and flatten as the cool. Allow them to cool on the sheets for 3 minutes before transferring to a wire rack to cool completely. *I've used both unsweetened natural cocoa powder and cocoa rouge, they both yield great results! **You can swap out the white chocolate for milk chocolate chips, peanut butter chips, mint chips, chopped nuts or dried fruit! Hi, Is it possible to share the recipe in a measure unit like gms? Wonderful!! Love the different chocolate flavors! I substituted a half cup of brown sugar for one of the half cups of white sugar. Yum yum. Thanks for sharing your recipe!